Academic success and the pursuit of excellence are key features of a Princethorpe education. We offer a broad range of subjects and a stimulating and well-resourced curriculum. We aim to foster a love of learning. Whilst Princethorpe is not an ‘academic hot house’, our passionate and enthusiastic teachers challenge and motivate our pupils to have the highest expectations. The academic performance of the school continues to go from strength to strength. In public examinations our pupils excel: in 2018 at the top end 34% of all A-level grades were A* or A and 80% of grades were C or better; at GCSE 43% of grades were new 9, 8, 7 or A* or A grades and 26% of pupils achieved eight or more 9, 8, 7 or A* or A grades. When looking at the academic “value-added” we give to our pupils, these results compare with any school in the country – bright students achieve outstanding results and children who find their academic studies more challenging achieve results between a half and full grade better than could be expected. We are of course delighted by these academic achievements, but we are equally proud of the qualities our students show as they leave the school to continue their education: kindness, respect and a strong sense of right and wrong. In the last few years we have changed our timetable to increase teaching time to the core subjects in the Lower School and all subjects at A-level. We have also developed robust internal monitoring and tracking programmes which run along our assessment and reporting schedules to ensure pupils are aiming for, and achieving, their best academically. Our aim is to ensure we develop all our students so they become resilient and have the independent learning skills they will need for life after Princethorpe be it university or work. For more in depth curriculum information please click on the attachments at the bottom of this page. Pupils in Years 7 to 9 follow a traditional programme, which draws on the best of and goes beyond the National Curriculum. The subjects studied are English, Mathematics, Science, Religious Studies, Latin, History, Geography, Computer Science, Technology, Art, Modern Languages, Music, Drama, PE and Games. Personal, Social and Health Education are catered for within our REAL Programme. In Year 9 a degree of choice is introduced to allow pupils to personalise their curriculum. In Years 10 and 11 the curriculum needs to be broad and balanced, in order to keep as many doors open for subsequent choices to be made at A-level and then for degrees, apprenticeships and careers. • Science - Pupils study either Double Science or Triple Science. Double Science is worth two GCSEs and covers Biology, Chemistry and Physics. Triple Science leads to three separate GCSEs, one in each of the Sciences. (In the interests of balance, only one Design and Technology subject may be chosen). Learning Support can be available in place of one GCSE option if appropriate. In addition all pupils continue with non-examined Games and Personal, Social and Health Education (PSHE) through the REAL Programme. Most pupils will take three subjects through to A-level as well as undertaking a Project Qualification (Level 3 Extended Project Qualification or Level 2 Higher Project Qualification). There is also the opportunity to take an AS Level in Core Mathematics for students who are not taking A-level Mathematics but would like to continue with their maths, perhaps to support other A-levels with considerable mathematical content. This would normally be in place of a Project Qualification. Help is given in choosing A-level subjects wisely, taking into account strengths and preferences, sensible subject combinations and future degree choices and career choices. Group sizes in the Sixth Form enable staff to give pupils a great deal of individual attention. At Princethorpe College we aspire to the Renaissance ideal that all people should endeavour to develop their capacities as fully as possible, to enjoy broad interests, profound knowledge and wide ranging accomplishments. 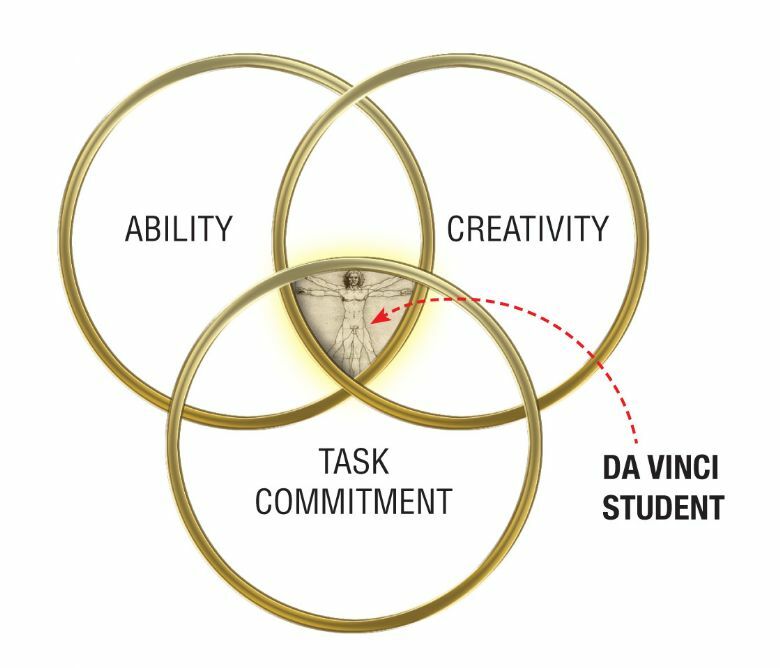 Whilst we may be born with certain predispositions, we are completely able to change and develop skills as much as we wish to and when a student demonstrates three interlocking traits - ability, task commitment and creativity - they will achieve high level performance. We recognise that young people can only perform at a high level if they are given opportunities to do so and this growth mindset is an integral part of teaching and learning at Princethorpe College. It is a mindset which encourages students to become independent, robust and enquiring and embeds a culture of challenge, aspiration and dedication throughout the school. Tasks which offer our pupils the opportunity to demonstrate their ability, task commitment and creativity are firmly embedded in the day-to-day delivery of the curriculum, exposing learners to complex resources, challenging questions, high-level thinking skills and within-class grouping. awarded the da Vinci Shield at the College’s annual Prize Giving. work produced by the pupils of the Foundation and is a showcase for our Renaissance ideal. research to teachers and a group of fellow pupils and take questions at the end. Pupils are assigned a mentor who provides advice and guidance as required and with whom they meet regularly for direct teaching, instruction and assessment, or other structured learning such as directed assignments or supported individual study. Pupils also meet regularly with the librarian and other pupils to be taught the necessary research and independent learning skills needed to undertake such a project. Pupils’ own private study is an additional commitment to these guided learning hours. Extended Projects are welcomed by many universities, and admissions tutors may well use them in differentiating between applicants for offer making. the equivalent of half an A-level. To view some of the outstanding work produced by our talented pupils take a look at our magazine, The Pinnacle.